Are your children using their computer, laptop, tablet or cell phone and the Internet most of the time in a passive way? Like watching videos, playing games, listening to music and consuming other entertainment. It’s just normal. It’s an easy way for children to show this behavior when they don’t know the tools and don’t have the skills to create things themselves. To be able to change the behavior of children from passive consumers to active creators we need to understand more about learning before we can come up with solutions. 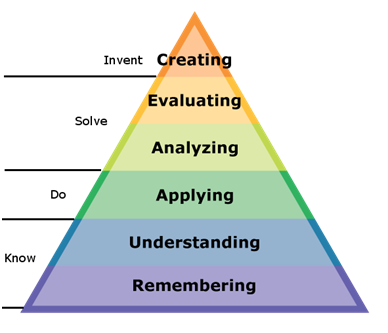 The pyramid of learning gives us a nice visualization of the steps of learning and the skills needed. Creating: Design a new program/machine for a given task. Improve a solution for a given problem. Evaluating: Select the most effective solution. Explain and justify a decision. Analyzing: Troubleshoot a broken piece of equipment/program. Gather information to investigate what is the problem. Applying: Solve a calculation with new variables. Construct a good sentence out of given words. To be able to invent and create new things we first need to gain knowledge about a topic. After gaining basic knowledge we need to apply the gained knowledge to get experience. When we apply our knowledge, we will encounter issues which we can solve by analyzing the problem and by evaluating our solutions and improving on them we will achieve better results. After we are able to solve problems, and when we have enough experience to solve problems we can invent new ways of solving problem by experimenting with different processes to come up with new solutions. Now that we know the steps needed to be able to invent and create new things, we can have a look at the tools available to help us with reaching our goals. The tools to reinforce learning will be topic of the next blog post.